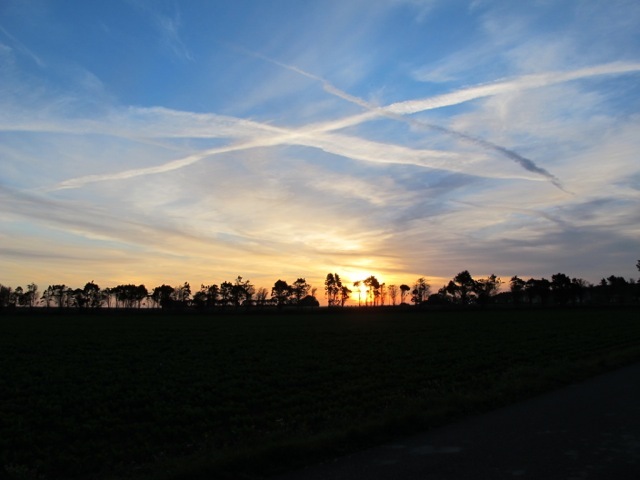 The enormity, the impossibility, the bravery, the awfulness, the wastefulness, the sheer chaos–you can read about it and watch films about it but standing on raised ground on that stretch of coastline in Normandy, is when the full story hits me. I’m looking out across the wide stretch of the English Channel towards the Hampshire coastline and my mind starts playing with the image like the photographic trick of fading a present day scene into a photo of the same location years before and I catch my breath. It’s a calm sea this Friday morning and empty, but at dawn on the 6th June seventy years ago it was a heaving mass of naval craft full of men about to put their lives in deadly peril. 156,115 troops landed on these beaches on the 6th of June 1944. Above the beach at Colleville is the American cemetery. There are the crosses and the Stars of David, laid out in perfect symmetry. At peace the soldiers honored here find order after chaos. A sea of white marble contrasts the sea turned red from blood on D-Day 70 years ago. 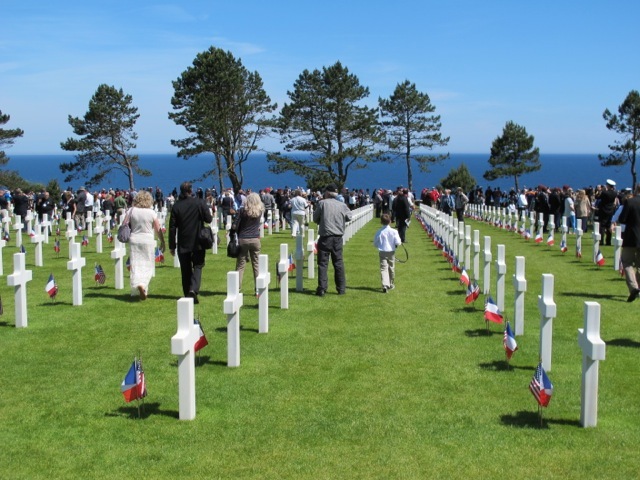 This morning 6th June 2014 the 9386 fallen heroes buried above Omaha Beach are joined by a multitude of commemorators come to pay our respects and wonder how such a thing could have been endured. An inland invasion this time and the crafts conveying the masses are coaches–hundreds of them–escorted from Caen to Colleville-sur-Mer by motorcycle gendarmes. There will be ceremonies all along the coast in the days to come on the beaches and in the villages that saw the story unfold. 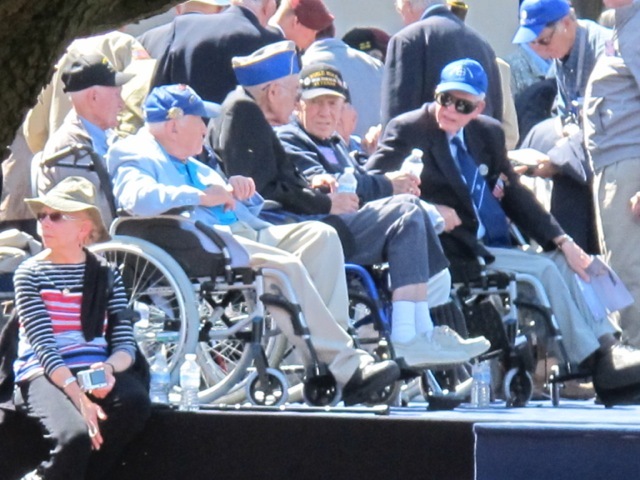 Some large involving Presidents and Queens and some more modest; many attended by some of the dwindling band of brothers brought together to save the world–70 years ago. A lovely comment, Robin, totally underrplayed making it even stronger, and bringing a choke to my throat. I hope you will write more. Thanks for sharing these very moving photos. We must never forget, the sacrifices made by these brave soldiers. And UKIP are exploiting all this in the name of Fortress England. The sacrifice was precisely that there should be no more conflict in Europe, that my generation (the same as Robin’s) should never know a battlefield, and hopefully the following generations, for which I personally am deeply, deeply grateful. Thank you, Robin, for your touching post. HOW BRAVE THOSE MEN WHERE. MY OWN DAD WAS IN THE RAF AND I AM SO PROUD OF HIM FOR WHAT HE DID FOR HIS COUNTRY. MY GRANDATHER WAS IN THE ARMY IN THE FIRST WORLD WAR IN THE TRENCHS IN FRANCE AND THE UNIQUE PART IS HE STRUCK UP A FRIENDSHIP WITH A FELLOW COMRADE AND TO THIS DAY OUR FAMILIES EXCHANGE CHRISTMAS CARDS. I WOULD GUESS THERE AREN’T MANY FRIENDSHIPS THAT LAST 100 YEARS!!!!!!!!! on June 9, 2014 at 11:10 am | Reply Jo Ann Wise. Thank you for that moving Tribute to our fallen heroes. My father in law was one of those who landed and survived. He lived to tell the horrors of that day. He and two brothers served our country and were on the front lines for nearly four years during the war. Their mother prayed every day for their safe return. Her prayers were answered as all three sons came home without a scratch. She was one of the lucky mothers but as your photo of the mass graves show not every mother was as lucky. My dear Dad was a wartime acting sub-lieutenant ,and at the time of the D Day landings was in charge of a very large double ‘landing craft (tank) ‘…..this was an American craft crewed by the British Navy ( a Mark 2 ?) He didn’t speak to me about the D day landings much ( he was a modest man but must have been very brave because he was ‘mentioned in dispatches ‘, but I think my son said this was for something which happened on another occasion ) ,but as far as I remember he was going into Omaha and Utah beaches . Thank you for such a lovely and heartfelt tribute to this tragic event that thankfully ended in triumph for all of us. I would like to add my tears of sincere sorrow and the deepest gratitude for the sacrifices of so many brave men who have enabled posterity to live in freedom. As with many of us who will see your beautiful words and pictures, my ancestors, including my Dad, served in WWII. 1 was part of the invasion. He came home. The calm before the storm….rest in peace dear brave souls. As a boy growing up in the 50’s, I had the wonderful opportunity to be around many of these fine men who fought for freedom (US) in Europe and the Pacific theratres. I never met a finer group of men ever in my life. I remember them all well to this day. We all went to church together, so I knew many. They were heroic, brave, dedicated, and had a wonderful good nature all about them. But they never engaged in bravado. I loved everyone of them. How wonderful that you went there. My 97 year old father is a World War II veteran, and was in Normandy the day after D Day. He never spoke to us about the enormity of what he saw, but he did go to visit there in the 1990’s. Those soldiers were true heroes. Thank you for writing this. I’m so glad that the focus, and not only in your moving piece, has been on those who were actually involved in the landings, giving us a last chance to hear their stories. We need to listen, remember and consider the implications. I agree with Rosalind about the modesty of many ex-servicemen about their wartime deeds. My father was also mentioned in dispatches (from the North Atlantic), but it was only from others that I learnt some of the details. I think the reluctance to speak about certain events may also have been a consequence of their traumatic nature. However, it meant much to me when two or three years ago there was a little ceremony during which the Maritime Museum here in Gdansk accepted into their safekeeping both my parents’ immaculately kept Royal Navy uniforms (my mother had been a Wren) and a small collection of log-books, equipment and other naval memorabilia. Little could anyone have imagined that they would end up so near to where the first shots of that war were fired. I look forward to Part 2 of your Normandy tribute. The pain and guilt caused by the war is very much alive for Germans today even though most of us have consigned the war to history. After the fall of the wall I had the opportunity of visiting my uncles grave in East Germany. Died in April 1945 at the age of 19 years on the Eastern Frontline for nothing. He didn’t want to go to war and the family wanted to hide him at his last visit at home but that was too dangerous.The SS would have shot the entire family in such a case. I admire my grandfather whom I unfortunately never met. He recognized the dangers of the Nazi system very early, he was listening foreign radio channels (“enemy channels”) and didn’t allowed it that his children were members in Hitler Youth or BDM. Sometimes they threatened him but he was a farmer and they were important for the supply. At the end of the war the Americans appointed him as mayor and wanted to betray them the names of all Nazis in the village. But he didn’t do that because they family have to live there and he didn’t want to create new bad blood. I hope we never see such times again. Awesome and awe inspiring! Thanks for this, Robin! In sorrow for all the lives lost in this and all wars!! 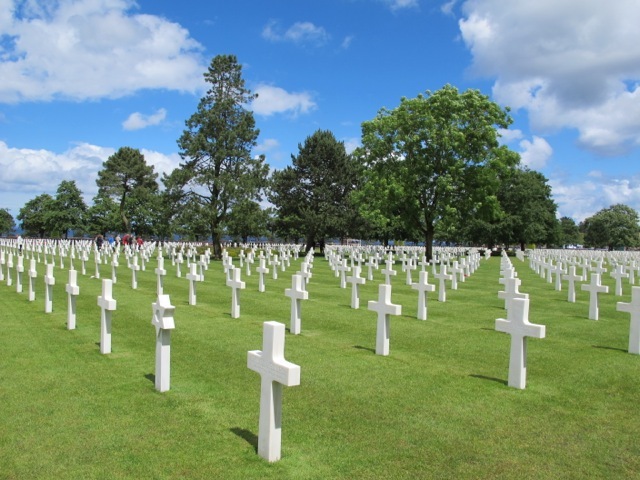 My husband (whom I lost this past November after 64 years of a happy marriage) visited this cemetery on our visit to the Normandy beaches a few years ago. It was a sobering experience then and I am sure it is now. Freedom doesn’t come cheaply; it’s paid for in lives lost and mourning for them by those left behind. Sobering, indeed. Thanks for the reminder. We need one now and again. thank you for your moving post. We all must remember the immense value of peace and democracy and at what terrible price it was conquered by our fathers. The city where I live changed deeply and has never been the same since then. I hope that human beings of any part of the world will respect each others, each others’ cultures and relgions and that such a terrible massacre will never happen again – but I can see little evidence for this for now! You write so movingly Robin and the pictures you paint with those words are so clear,we are almost with you.I was born in 1950,dad was a soldier,though not on those beaches,but he was at Dunkirk,where waiting to be taken off he meet another solider who turned out to.be his. brother in law married to.his sister who he thought was dead, they had been separated in childhood,each thinking the other no longer alive,so there was some happiness in that hell.We must all never forget the cost that was paid by these brave men and woman,maybe still is being paid,and always will be.Thank you so much. Thank you, Elaine–what a story! Articulate and insightful as always.It seems that so many were touched by this event in some way as indicated by the comments here.Each man or women had a part to play whether American,Canadian,British or another group who put it out there to do what they could.There were so many subplots…the tanks that were not supposed to sank but did,the fact that Rommel left France for his wifes birthday and was confident it would happen on another day.Canadians landed on Juno….all did their part with regiments from Nova Scotia to New Brunswick. Robin, thank you especially for the map. 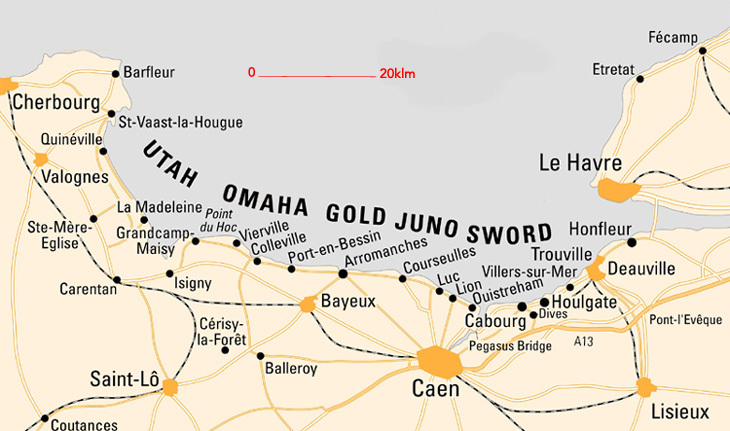 Here in the States I grew up hearing about Omaha and Utah Beach, and knew they were on the Normandy coast, but I’ve never seen it laid out so precisely as you have. Seriously, your prose grows more evocative with each post. You absolutely must publish selections from your blog, this among them, and go on to more writing. What a touching description Robin! All the media coverage here hasn’t described it any better! Thank you so much for this! My dad was a pilot in WWII and died 6 years ago. My dad was part of the Greatest Generation the likes of which we will never see again. Thanks Robin. I wonder every year at this time what more could be said about that awful day………..but say it we must ; every year until the end of time. Thanks Robin for putting us THERE, through words and pictures. You walked on hallowed ground and shared your experience. I am in awe of everyone who was on those beaches and surrounding countryside that fateful day. 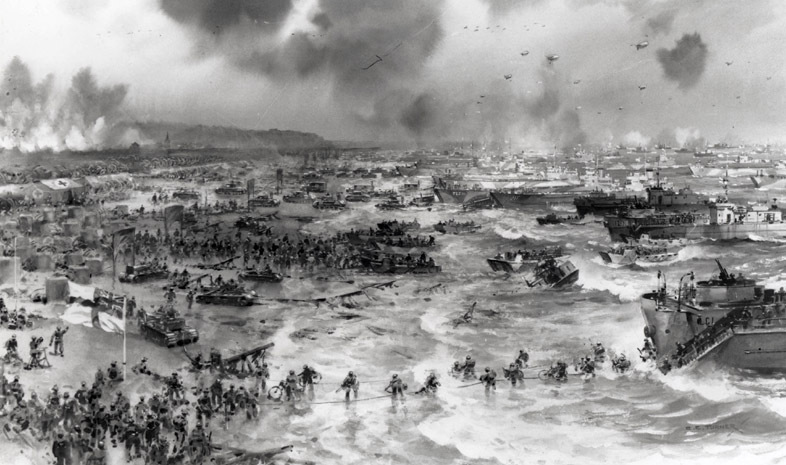 And as an American, I am so thankful that our Allied forces turned the tide for Europe and the world. God bless! How fine that you could be there to commemorate that awful/wonderful/moving day! I’m deeply envious. Thank you for sharing your thoughts and the images of the place. I never got to meet my uncle Bill. It is really sad when you here about how many people died. Long live the Heroes that fought and to our great soldiers that surived. Dear Robin and Meredith — I’ve waited some time to submit my reply because the subject is so inexplicably and overwhelmingly moving, I knew it would be days before I could come up with words. 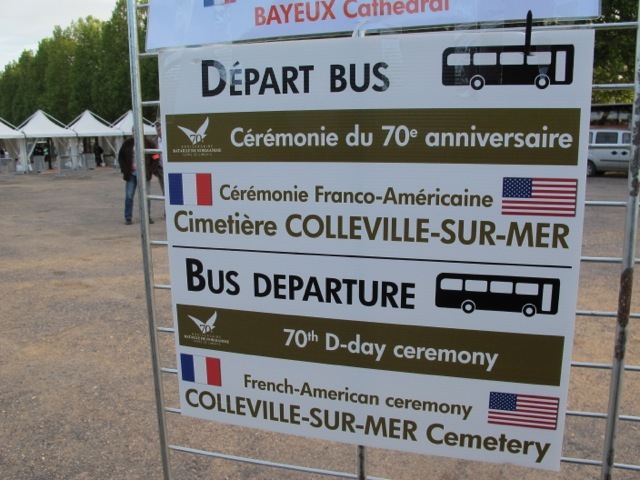 I’d like to thank you for sharing your journey to Normandy on the 70th anniversary of the D-Day Invasion with your many photos and thoughtful remarks. The bravery and heart and actions of those soldiers who landed and fought and died on those beaches in Normandy cannot be fully comprehended in their entirety in my mind, their actions having been so tremendous. I only know that the efforts of those soldiers and their fellow soldiers elsewhere, left the world a beautiful and safe place to live in. I am grateful that I grew up a child in the light of their generation. It is humbling to be there and realize the enormity of what they did.